France’s Justice Department is not independent of the government; no judge will seek to know more about Macron’s scandal. No thorough and deep investigation will take place. The French media are largely subsidized by the government and no more independent of the government than the Justice Department is. Even the French media that are not funded by the state self-censor what they report, because they are supported by businesses that depend on government contracts. No French journalist will try to discover a thing. When Emmanuel Macron was elected president of France in May 2017, he was portrayed as a reformer who was going to change everything in France and beyond. Fourteen months later, illusions are gone. The reforms carried out have been essentially cosmetic and failed to slow France’s sclerotic decline. Economic growth is close to zero: 0.2 per cent in the second quarter of 2018. Unemployment, at around 8.9%, remains high. French public spending as a percent of GDP is, at 56.4%, still the highest in Europe. The country is still frequently paralyzed by public transportation strikes. No-go zones continue to spread, and Macron himself recently admitted his helplessness by asking for a “general mobilization” of the population. Riots are frequent; large-scale public events lead to looting and arson. The night after the French team’s victory at the soccer World Cup, hundreds of thugs mingling with the crowds broke windows, vandalized banks and ATMs, destroyed street signs and torched cars. As most economic activity in France stops in July and August, Macron might have thought he could enjoy a summer break. He could not. 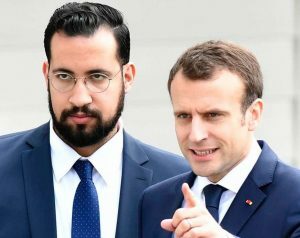 Benalla (pictured with Macron) was, in fact, Macron’s personal bodyguard. He protected Macron at all times, including during private trips to a ski resort or on the beach. Documents were made public showing that Benalla claimed to be “deputy chief of staff of the President”; however, on any official list of staff members, his name never appeared. Benalla also obtained secret security clearance without apparent justification, and although he did not pass the exam to become a gendarme, he magically received the title of lieutenant-colonel of the Gendarmerie — the same title as Arnaud Beltrame, a hero with more than two decades of exemplary service, crowned by exchanging himself for a woman held hostage by an Islamic terrorist who then slit Beltrame’s throat. Benalla enjoyed all sorts of perks, from a chauffeur-driven car to a 2,000-square-foot apartment in a sumptuous state-owned building. He also was not prosecuted for a recent hit-and-run. Macron’s political opponents, left and right, asked for a parliamentary commission of inquiry. The Minister of the Interior said he was aware of the May 1 assault but added that he only learned Benalla’s name by reading it in the newspapers. The Paris police chief spoke of “unhealthy friendships” but refused to give any details. The secretary-general of the main police officers’ union (SGP Police FO) spoke up about the presence in the president’s entourage of shady security guards “acting beyond any legal control” and clashing with members of the official protection services. It seemed he was hoping to intimidate critics and impose silence. He did not succeed. But the Justice Department in France is not independent of the government; no judge will seek to know more. No thorough and deep investigation will take place. The French media are largely subsidized by the government and no more independent of it than the Justice Department is. Even the media that are not funded by the state self-censor what they report because they are supported by businesses that depend on government contracts. No French journalist will try to discover a thing. As the French Constitution does not provide for impeachment, French Presidents enjoy almost complete immunity. Macron knows that his predecessors were able to stay in power despite their many scandals. Charles de Gaulle created a highly questionable militia that existed for thirty years: the SAC (Civic Action Service). François Mitterrand dissolved the SAC after several of its members were involved in a bloody killing near Marseilles. Mitterand then created a “counter-intelligence” unit — based at the Élysée [Presidential] Palace — in charge of intimidating those who might reveal the existence of his hidden second family. In 2005, nine years after Mitterrand’s death, members of the unit were tried in court for illegal wiretapping during the Mitterrand presidency. Only in 2011, four years after his second term was completed, was Jacques Chirac given a lenient two-year suspended prison sentence for having diverted public funds and abused public trust during his presidency. The columnist Ivan Rifoul, in a recent book, described Macron’s victory as a “masquerade” organized by “socialists in decline”, “EU apparatchiks”, supporters of the Islamization of Europe, and crony capitalists. Macron will remain president. He will nevertheless be a diminished president. 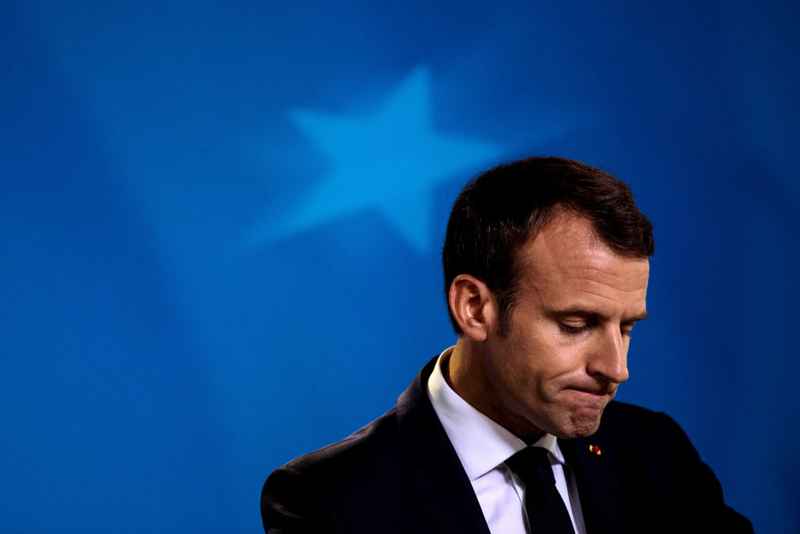 Macron pretended to embody an “exemplary Republic“; he will not be able to do that anymore. While Macron had previously been able to marginalize his political opponents, those days seem to be over. His opponents have already been criticizing the absence of results of his economic policy — slight income tax cuts but many new regulations, and small changes in a very rigid labor code – as well as his weak response to the rise of burglaries, car- jackings, rapes and social unrest. Now all Macron’s decisions will be treated with suspicion and scrutinized without mercy. He has already postponed a reform of the constitution that was supposed to strengthen presidential power (namely, his own). Other projects he began — such as mass civil-servant layoffs and early-retirement buyouts and unemployment insurance reform — will likely be abandoned. His approval rates are falling. The deterioration of France rolls on. A violent fight recently broke out between the residents of Calais and illegal migrants living in a vast slum encampment — home to approximately 6,000 migrants — that reporters call the “Calais Jungle“. The government has promised many times to take care of the situation, but has not solved the problem. Meanwhile, Calais, with 75,000 inhabitants, is a ravaged city: home prices have collapsed, shops and restaurants have closed their doors, and people are moving away. In May, some members of parliament published a report on the situation in the Paris suburb of Seine Saint Denis. According to the report, 20% of the area’s population consists of people similar to those living in the “Calais Jungle”; hundreds of businesses are on the verge of bankruptcy and the police are too frightened to do effective work. The same situation exists in other parts of the country. Riots recently erupted between Muslim gangs in Nice, on the French Riviera, as well as near Porte de La Chapelle, inside Paris. Polls show that if a presidential election were held now, no other French politician could replace Macron, even though Macron won only 23.8% of votes in the first round of the 2017 election. The majority of those who voted for him in the second round seemed to be voting more against his opponent than for Macron. He never had popular support. As for the rest of the continent, Macron is one of the main defenders of a multicultural, post-national, post-democratic and post-Christian Europe. A growing number of Europeans see that trend as leading to the destruction of their own civilization and have been voting for leaders who resist it.